There is something about a conversation between two brilliant men of science in the intimate space of Kepler’s Books in Menlo Park that feels like a private conversation you might only imagine if you could have a one-on-one with two leading experts. Such was the personal conversation between the Nieman Fellow and professor emeritus of journalism, science journalist Jon Palfreman and Dr. William Langston as they chatted about Parkinson’s disease. Dr. J. William Langston is the founder, CEO, and Scientific Director of the Parkinson’s Institute. 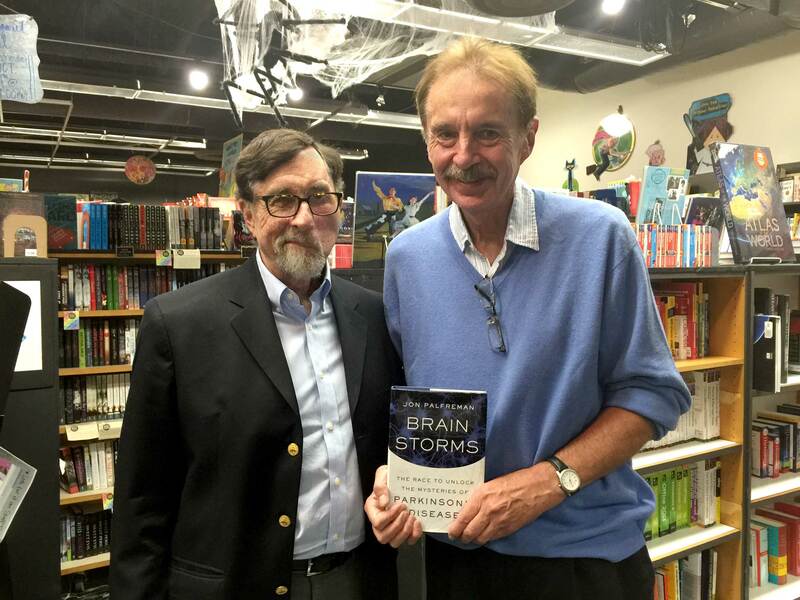 Langston praised Palfreman’s book Brain Storms and joked that it is wonderful to have the journalist [Palfreman] on our side now,” referring to Palfreman’s diagnosis of Parkinson’s. Langston described how Palfreman, now with a personal vested interest in PD, interviewed the top 30-40 doctors for his book of “brilliant science” and speculated that Brain Storms is the best book ever written on Parkinson’s disease. Langston described the three latest disease-modifying therapies which include Rytarie, an extended release capsule with little capsules of carbidopa levodopa inside that offers a smooth response with less side effects. An Inhaled levadopa that has been developed to treat OFF episodes, and a belt-worn pump that shoots medication continuously under the skin, straight into the blood stream. Both speakers praised exercise, with Langston quoting the familiar saying that “a mile a day keeps the doc away” and that exercise helps improve gait and balance.